Incorporating technology into your lessons can be quite a challenge. This challenge is magnified when using the computer itself proves to be a struggle. This page will provide a range of applications that teachers can use easily to enhance their teaching and learning in the digital age. Wallwisher - What do you know about classification? Wallwisher lets you, with very, very minimal registration, create a “wall” where you can place virtual sticky-notes. You can allow others to also place notes on the board, or keep it so that only you can do so. The sticky-notes can include images you grab off the web, videos, or websites, and you can add text to them. Each sticky has a 160 character limit for text. Newsmap is a visual representation of the day's news. Using Google news as its source, it separates information into countries and, within that, colour-coded categories - like national, world, sport, business, technology etc. You can read the original news story by clicking on the item. Save the words - Pick Me! Pick Me! Lubency, boreism, famigerate, primifluous ... these are just some of the unusual words you will find explained and used at Save the Words. You can 'adopt' a word, which means you promise to use it in correspondence and conversation, or sign up for 'word-a-day' emails. Make sure that you have your sound turned up! Web2.0 - Which one will I use today? 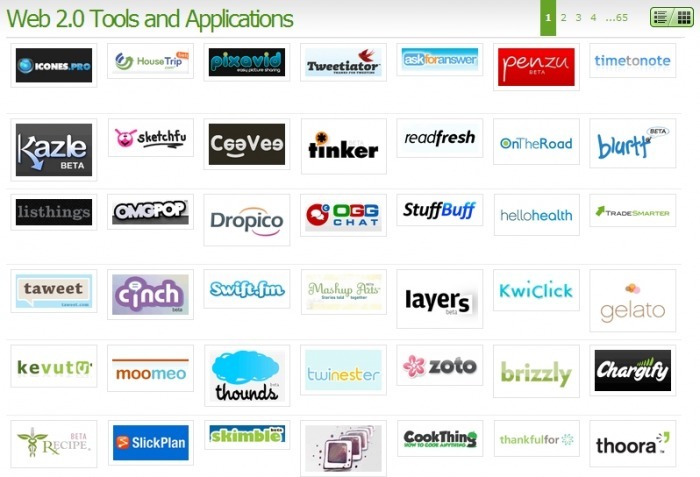 There are new Web 2.0 tools appearing each day and although some of these tools were not originally meant for use in the classroom they can be extreamly useful for educators. Web 2.0 Tools provides a list of tools and applications that may be useful to teachers and students. Short descriptions, comparasions, reviews, and ideas are provided! Atlas of the Biosphere is a series of maps about Human impacts, Land Use, Ecosystems and Water Resources. Click on any of the four map categories to view maps relating to your chosen topic. You can view maps relating to the whole world or depict data by continent. At Atlas of the Biosphere you will find downloadable data on; average rainfall, infant mortality, population density and much much more! GoAnimate allows you to creat cartoons with motion, sounds, facial expressions and background sound effects. After creating the cartoon the site provides an embedded code so that you can share the clip on facebook, twitter or via email. With Xtranormal you can create 3D animated films in which the characters move and talk according to your script.